In the spirit of providing you guys the very best in mostly useless trivia/info, we have this from the home office at MP 9. We were playing around with how many of these were still with us and or what has happened to them over the years. The list is certainly not fully developed with dispositions, but its a start. Feel free to add or modify. 7 cars, sleeper lounge obs. 18 cars, parlor lounge obs. Hobe Sound -- This car is out there somewhere, right? 5 cars for SP -- all 10 roomette, 6 bedroom! 2 cars for DL&W -- Phoebe Snow and the only slab side Budd obs cars? One of the NYC/KCS cars survives somewhere down south. Mr. Dean Levin had photos of it. It had an interesting repair from its KC service where some of the fluted siding was replaced by flat sides towards the end of the boat tail. I think the C&O/RJ Corman car is not part of the Lexington, KY dinner train operation after spending many years in Bardstown. Certainly blows my mind that the NYC had 25 of these! Gives you an idea of the size of the passenger service they operated. The two DL&W cars belong to Metro-North (NY State MTA), not to Connecticut DOT. A friend of mine pointed and said "Look, a Burlington car". I pointed to the very faded, but still legible keystone, and remarked "Burlington? MY A__! !, This is a PENNSY car!" I need to verify if this car is still here. This Google Map street view in from 2011 -- it has been at the location for some time. This location is about half block east of Alameda Street. Here is another view -- looks like the car is still up on trucks. But it has a door cut into the side of the lounge. SP9027 was later purchased by Craig Rasmussen and lettered as "Overland Rail Travel" 9027 - "Tehachapi." Used in charter service and leased to Amtrak during one of the early summer seasons for use LA-Seattle along with two other privately owned 10-6 cars. The car was later sold to Mexico. Rasmussen was one of several owners of Overland Rail Travel to which the car was leased for operation. Rasmussen also had SP P-S blunt-end 10-6 #9043 which was also leased to Amtrak that one summer. When Overland Rail Travel was dissolved the the various owners disposed of their cars in different ways Rasmussen also had a modernized UP heavyweight chair car that was given to Orange Empire. 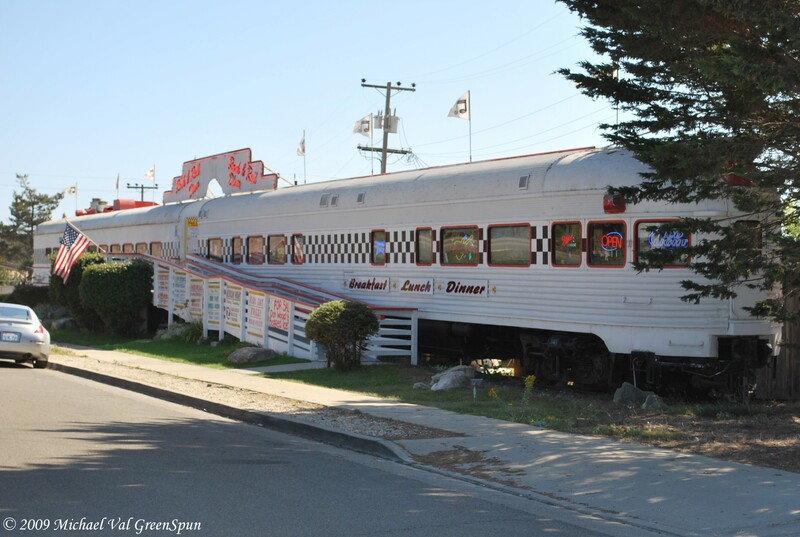 One of the other owners had modernized UP diner 4054 that was given to San Diego RR Museum at Campo, Cal. *For #60 and #67, Randall lists Hofheinz in 1968 and Link lists Ringling in 1964/65. For #61, Randall lists the Vets Club in 1965 and Link lists KCS in 8/1966. For #66, Randall lists NdeM in 1964 and Link lists KCS in 8/1966. For #70, Randall lists the sale to NdeM as 1961 and Link lists the sale as 5/1962. For the five cars listed as sold to NdeM in 12/1957, Randall lists the sale as 1958 and Link lists the sale as 12/1957. *SCL added rear-end diaphrams to #6600, #6603, and #6604 for mid-train service. *SAL added rear-end diaphrams to #6606 and #6607 for mid-train service. AT&SF Navajo sold 1957 to Intermountain Chapter NRHS to Colorado Railroad Museum (Golden, CO). The Navajo is one of three surviving cars from the original Super Chief. 36 seat diner #1474 Cochiti is at CSRM (indoors and open to the public) and club lounge-barber-dormitory #1370 Acoma was recently restored and upgraded to Amtrak requirements as #800720. 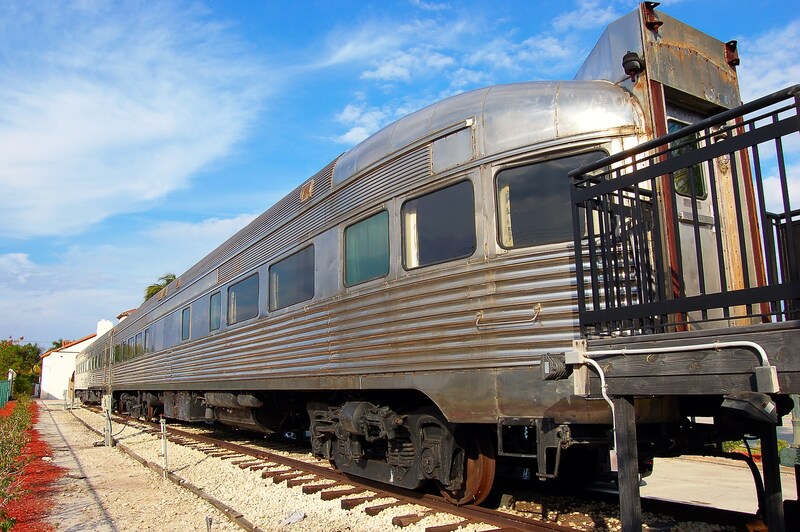 The Acoma is owned by John Bond and Ronald & Lorie Ashcraft through Southwest Rail Car LLC. Work was performed by Monad Railway Equipment. *Randall has the spelling as Tom McKeowen, and Phil Dohmen has the spelling as Tom McOwen. McOwen currently owns CB&Q North Coast Limited Budd dome coach #558 and SP Sunset Limited Budd 10-6 sleeper #9020 through the Cincinnati Railway Company. Landis, home of Corriher Mills, is in North Carolina. Approximately 1995 Kasten traded the car to MARC for ten RDC cars(!). MARC had Kasten retruck the car to Pennsylvania Railroad trucks for commonality with the MARC Heritage car fleet. MARC then upgraded the car with a Stadco generator, a Moran HVAC control and emergency glass windows. The car operated on about five special events and was used as a meeting room for special meetings. It was then loaned to the Baltimore & Ohio Railroad Museum. At some point during this time, one of the stools at the lunch counter was removed as the car currently only has seven stools. In 1960 all four cars were sold to Kansas City Southern Railroad with #48 being renumbered to KCS #44. 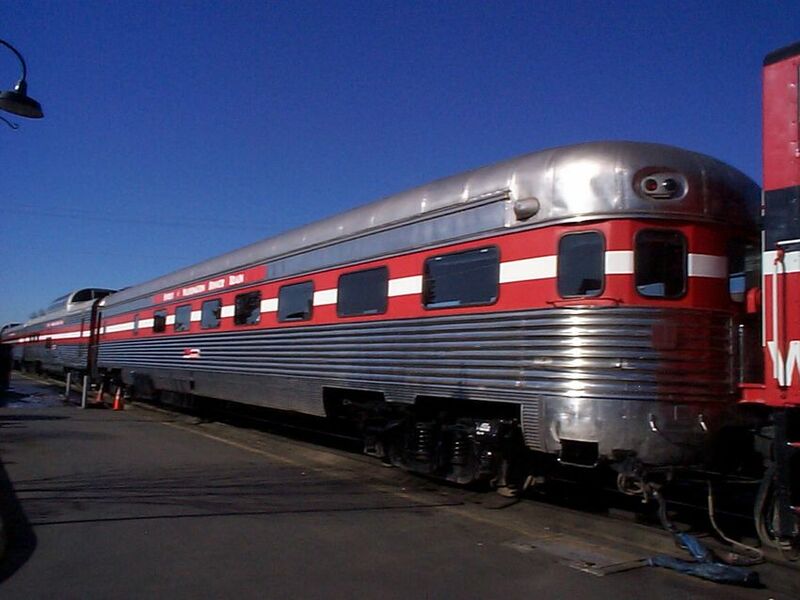 The cars were then sent to Pullman Company in 1963 to have the bar area replaced with an 8 seat (stool) lunch counter, the tavern and lounge areas of 53 seats replaced with a 32 seat lounge, two windows behind the bar area removed and the car painted in the KCS colors of black with yellow and red stripes at the bottom. 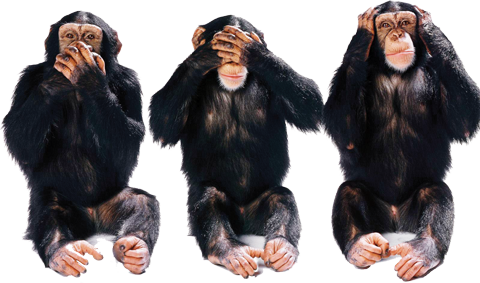 The car was again renumbered to KCS #43. While on the KCS, these cars ran between Kansas City and New Orleans in the Southern Belle, as well as between Kansas City and Port Arthur, Texas in the Flying Crow. 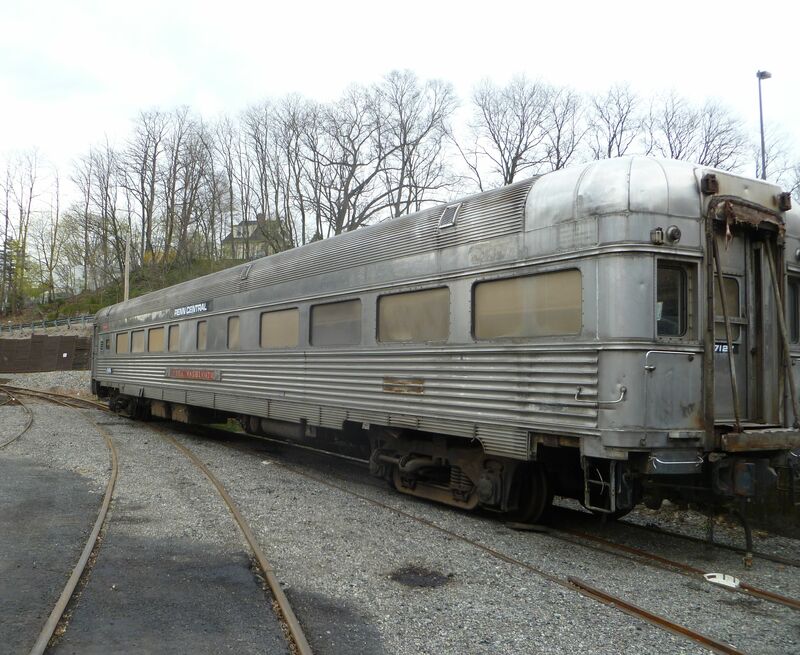 This car was built as part of FEC's consist contribution to the ACL's "Champion" service and was on the end of the first southbound Champion leaving Pennsylvania Station on December 1, 1939. Sister car Lake Worth was built for FEC's "Henry M. Flagler" but was assigned to the "Dixie Flagler" on December 17, 1940. I've not been able to come up with a date for when Bay Biscayne was acquired by the New Georgia, but it had to be after 1988, since a roster published in the Feb. 1989 issue of Trains does not include it. Mr. Steve Polk was the Director of the Georgia Building Authority and the car was named in his honor. Mr. Polk died in March, 1990, so my guess is the car was new to the roster when he died. The other cars already had corporate sponsors and names so it would probably be safe to say the 1508 came to New Georgia in late 1989 or early 1990. Another car, reportedly former ACL Pullman-Standard coach #237 had been acquired in 1987 and assigned #1508, but by 1988 the car had been converted to lounge #100 "Coca Cola". When it came to the SAM Shortline the "Steve Polk" was an open car. Who was responsible for removal of the interior and the other interior changes is another question I have, but fortunately, the bar had been retained when the lounge area seating had been removed. Between 2005 and 2007 the SAM Shortline worked to do a restoration of the lounge seating based on original layout of the lounge section. We wanted to put reproduction seating in the obs lounge but money ran out, so tables & chairs are used in the obs section. I think there is some debate on which NYC car ArtTrain really had. The car was gutted down to the bare metal, so there aren't any hints on the car. That explains why there are different histories for NYC 48 above. Of the Santa Fe cars, how many were converted to flat-end mid-train cars? I can only think of one that wasn't, at the Age of Steam museum in Dallas/Frisco, but not sure if this is a Budd car or not. What about additional rebuilds? Like Silver Chalet. Rebuilt into open platform lounge by Northern Railcar for Quadgraphics. The car was stored for a time in 1978 on the Los Angeles Jct. Rwy., I was there when it first was brought on the line and weeks later when it was stored on an unused industrial siding with the passenger cars acquired by Los Angeles County. Wish I had a camera but then would have lost then anyways in a forest fire in 1985 when my mother's trailer burned down. Last edited by jmlaboda on Mon Feb 17, 2014 7:03 pm, edited 1 time in total.